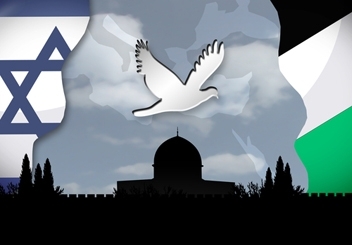 The ongoing struggle and the Middle East peace process. If Israeli national identity stems from historic longing and contemporary political realization, a sense of Palestinian peoplehood stems from indigenous settlement. Though Palestinian nationalism developed a generation after Zionism, Muslim and Christian Arabs who identify as Palestinian root their nationality in centuries of continued residence in the land that they call Palestine and that Jews call Israel. Israelis’ and Palestinians’ conflicting claims to this land have led to mistrust and bloodshed on both sides throughout the 20th century and into the 21st. In the aftermath of World War I, the European powers awarded Britain the right to determine Palestine’s fate. In 1937, desperate to separate the feuding Jewish and Arab communities, Britain recommended partition of Palestine into two sovereign states, Arab and Jewish. The Arabs rejected this proposal, unwilling to cede what they felt was Arab land to yet another colonial power. Following the Holocaust, Jewish refugees from Europe and Arab lands streamed into Palestine, and Jewish-Arab conflicts intensified. When partition was suggested a second time in 1947, and Israeli statehood was declared in 1948 with the support of a United Nations vote, Palestinians and surrounding Arab nations were ready to go to war for complete control of the territory. Jews, by now almost a third of its population, were prepared to defend their embryonic state. The ensuing War of Independence saw more than 700,000 Arabs fleeing the territory, becoming refugees under Israeli, Egyptian, or Jordanian rule. While the traditional Zionist narrative asserted that Arab leaders encouraged their constituents to flee (with the promise of eventual victory and return), recent scholarship has shown that Jewish fighters did, at times, forcefully evict Arabs. Eventually, the area designated for Palestinian sovereignty was conquered by Jordan’s Arabian monarchy. Jerusalem was left a war zone, and an independent Palestinian state never emerged. The simmering conflict exploded once again in the 1967 Six-Day War, when Israeli counterstrikes took over all of Jerusalem and captured Gaza and the West Bank. The territories captured in 1967–beyond the so-called “Green Line”–remain one of the most contentious issues in the conflict. Following the Six Day War, there was much debate about what to do with these occupied territories. Eventually, Israel allowed–and sometimes encouraged–its citizens to settle some of the strategic and historic areas in this region. Many Jews who settled these districts–traditionally called Judea and Samaria–believe in their right to all of Palestine promised by the British in 1917. Some of these settlers, particularly religious ones, trace their right to the land to God’s biblical promise to Abraham. The religious aspects of the conflict also became especially apparent in discussions of who should rightfully own Jerusalem and its Temple mount, an area layered in religious meaning. For Jews it is the site of the original, ancient Israelite Temple. To Muslims, it is the site of two great mosques, the religious center for Palestinian Muslims. Further complicating matters, Israel annexed East Jerusalem after the 1967 war, and a united Jerusalem has often been a key platform of Israeli governments. Meanwhile, the Palestinians have insisted upon East Jerusalem as the capital of any future Palestinian state. In addition to the settlements and the control of Jerusalem, the status of Palestinian refugees is another crucial issue in the Israeli-Palestinian conflict. There are more than four million Palestinian refugees–a number that includes those who left their homes during the 1948 war and their descendants–who live in the West Bank and Gaza, Lebanon, Syria, and Jordan. Traditionally, Palestinians have insisted that a right of return for these refugees be part of any final peace deal. Israel has rebuffed this demand, as an influx of several million Palestinians would be both logistically unrealistic and would threaten the Jewish character of the state. In 1987, with the outbreak of the Palestinian Intifada (uprising — literally “shaking off” in Arabic), pressure on the Israeli government to find a solution to the problem of the territories mounted. As part of the 1993 Oslo accords, signed by Israeli Prime Minister Yitzhak Rabin and PLO Chairman Yasser Arafat, Israel agreed to begin military withdrawal from parts of the West Bank and Gaza, and follow a five-year process of “empowering” the Palestinians toward territorial self-government. There were, however, many hurdles in reaching permanent peace, not least of which was the 1995 assassination of Rabin by a right-wing Israeli extremist. A second, bloodier Intifada broke out in 2000. Where the first Intifada was characterized by Palestinian youths throwing stones at Israeli soldiers, the second Intifada took on the aspects of armed conflict, guerrilla warfare, and terrorist attacks. The devastating effects of suicide bombings within Israel proper increased the pressure to find a solution to the ongoing conflict, and polarized those with differing views about what that solution might involve. In 2003, the United States made efforts to stem the violence by designing the “Road Map to Peace,” which proposed a two-state solution. Like many previous attempts at peace, the Road Map faltered early on and violence continued. Yasser Arafat, leader of the Palestinian people through both negotiations and violence, died in 2004. Since then, Israel has enforced closures on the Palestinian territories, and erected a security fence separating parts of the West Bank from Israel proper. In 2005, Israel set a new course in its approach to the Palestinian-Israeli conflict: Disengagement. In a bold and controversial step, Israel evacuated its settlements in the Gaza strip, removed its military forces, and left the area to be governed by the Palestinian Authority. As militants in Gaza continue to fire rockets on Israeli communities over the border, some Israelis question whether the disengagement was worth it. Others advocate freezing settlement in the West Bank, and continuing efforts to trade land for peace. In the past decade, there have been several attempts to restart Israeli-Palestinian negotiations, but little progress. Increasingly, people on both sides of the conflict are expressing skepticism that a two-state solution remains possible. The expansion of Israeli settlements in the West Bank, along with the persistence of Palestinian terrorism and the general unwillingness of both sides to come to the negotiating table, has added to this skepticism. The ongoing conflict with the Palestinians has led some people in Israel and abroad to question the basic premises of Zionism, and wonder whether Zionism and peace with the Palestinians can ever be compatible. One thing is certain: The conflict is a defining feature of Israeli society, and it has no simple solution.